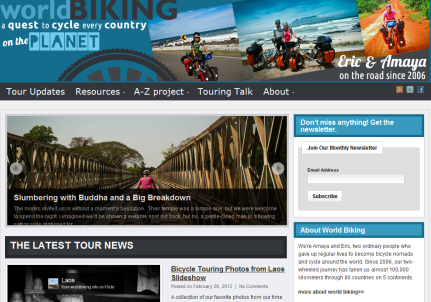 Copenhagen to Sydney by Bicycle – Go Bicycle Touring! In October 2010, Thomas Andersen set off from his home in Copenhagen on a quest to reach Sydney by bicycle. His bicycle touring route will take him through Denmark, Poland, Slovakia, Romania, Bulgaria, Turkey, Syria, Jordan, Egypt, UAE, India , Bangladesh, Thailand, Malaysia, Singapore, Indonesia and finally on to Australia. This is a popular overland cycling route, so if you’re thinking of a similar trip jump aboard and join Thomas on his epic adventure. Thomas is currently in India, where he’s making quite a splash in the local press. Although he travels relatively fast, cranking out around 100 kilometers per day on average, Thomas finds time to update his site on an almost daily basis. This is what we use to grow babies” was Ana’s words as she prepared the porridge for breakfast. It also worked for a cyclist. After the goodbye which is the ever returning theme of this trip, I was riding away into a cold morning in Ukraine. As I got out of the city the roads even got icy for an hour or two before the sun had warmed everything up again. And what a joy to see the sun out in full force after more than a week. The Ukrainian roads are, I think, the worst I have ever cycled. The biggest problem is that they are very muddy and everything on the bike, bags, shoes get covered with dirt. And that on a day without rain. This is a full-on bike touring adventure, so jump on board now and join the ride to Sydney.